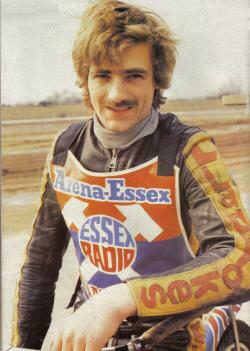 Wally Mawdsley was the man who brought speedway to the Arena-Essex complex at Purfleet. He had other promotional interests at Canterbury and Swindon so was not a newcomer to the game. The circuit was already in regular use for banger racing so obtaining the necessary planning permissions was a relatively straightforward process. The biggest obstacle to Mawdsley's ambitions was actually a gentleman named Terry Russell. Russell, the boss of a successful cleaning company, was promoting at nearby Crayford and when he objected to the plans it seemed the venture would be still-born. That's when fate played a hand. The landlords at Crayford cast doubt over the long-term future of speedway at the venue and Russell moved his team to Hackney. That cleared the way for the bikes to take up residence at Arena Essex in time for the 1984 season. Ironically, Terry Russell was to become promoter at Arena Essex in the years that followed and his brother Ronnie was until very recently in charge of the club. Mawdsley decided against adopting a completely new identity and christened the team the "Arena Essex Hammers". The Hammers nickname had been used for many years by the West Ham speedway club that had closed in 1972. By reviving the nickname it was hoped that some former fans would be attracted along, failing that, there was always a chance it would capture the imagination of West Ham football fans. The club colours were also to follow the 'West Ham' theme and were initially going to be Claret and Blue. These were changed in the pre-season to Red and Blue when a tie-up with the local 'Essex Radio' station was agreed. Mawdsley needed a reliable team manager to look after his charges and brought in Peter Thorogood to do the job. Thorogood had previously been sacked by Terry Russell as part of a reorganisation of the Crayford promotion. The track was like no other British circuit before or since as it had no safety fence. Instead a series of flags marked the perimeter of the track and the surrounding stock-car circuit acted as a run-off area for any out of control competitors. As a result the circuit was controversial and drew a mixed response from the riders. It remained fenceless until Terry Russell took over the club in 1991. The first meeting at the track was staged on April 5th 1984, an individual event for the Essex Radio Championship. The meeting featured some of the riders who were scheduled to ride for the Hammers alongside some visitors from local National League circuits like Rye House, Mildenhall and Canterbury. Sadly weather conditions were not great, surely the worst nightmare for any new promoter? The meeting was won by Bobby Garrad of the Rye House Rockets. He defeated Alan Sage in a run-off after both riders had notched fourteen points in the heats. Sage was one of the riders who would appear for the new Hammers team, he was also a link with the past as the last West Ham Hammer to still be in competitive action. The next best Hammer was Bob Humphreys who finished on ten points. The veteran Aussie was on the comeback trail and this was his first meeting since the end of the 1981 season. Bobby Garrad 14 (run off winner); Alan Sage 14; Barney Kennett 12; Bob Humphreys 10; Kevin Smart 10; Kelvin Mullarkey 9; Jamie Luckhurst 8; Alan Mogridge 8; Mark Summerfield 7; David Smart 7; Carl Baldwin 6; Jeremy Luckhurst 5; John Graham 4; Paul Bosley 3; Kevin Price 2; Martin Goodwin 0. Newcomer Martin Goodwin failed to score after a disastrous night of machinery problems. He would go on to be a great servant to the club and a consistently high scorer. "Under the circumstances, it was very good. The track held up quite well and although there were a few holes here and there, it was nothing too serious. The rain was the only problem. The crowd was around 2,500 to 3,000 which we were well pleased with. I'd said we'd get about four or five thousand but the rain put a lot of people off. Overall, we couldn't have asked for anything better. The boys put on a fantastic show all things considered and it turned out to be a good night."